Average Health. Athletic. Large Tall Man. When I felt a muscle spasm starting from an impinged nerve, I would set the electrodes surrounding the muscle group on synchronous with an off time of zero. very portable-can be taken to office, on trips and used in the car. battery DOA. pads adhesive limited. helps revive torn bicep . Average Health. Large Tall Man. by Bluewater from Stanardsville, Va. Item works great, I would recommend. Sturdy. Safe. Easy Storage. 9 volt battery usage. Lightweight. Following Surgery. Elderly. Tight muscles. Average Health. Elderly. Very active. Athletic. Sturdy. Safe. Lightweight. Easy Storage. economical. Can I use it on my fingers? What comes with this unit? 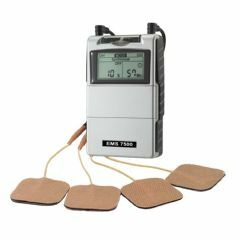 Can this device be used on the bottom of ones feet? I had severe plantar fascitis and got serious about getting rid of it. I started stretching the bottoms of my feet and using this ems machine. I did both, every other day for 6 months. Religiously! I used the EMS as high as I could possibly tolerate. My feet feel so much better I can't even tell you. I accidentally left my machine in a hotel and am buying another as we speak. I will always keep one to use occasionally. I never want plantar fascitis again! Can this be used to help the muscles on the face relax as residual from Bells Palsey? Can this be used on back of lower neck or shoulders?